I received this iron as a Christmas gift. My previous one had been malfunctioning, and so my aunt picked this one up at a discount. It's performed superbly so far, and it's made ironing much easier and more convenient. This iron is digital, even including a digital display, which makes setting the correct temperature much easier than on my old analog model. The display has a strong backlight, which means I can easily set this iron up without having to try and figure out what the screen says. 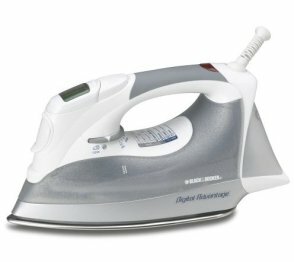 In addition, this iron has a smart temperature tone, which alerts me when the iron has finished preheating and is ready to do its job. I need to iron nearly every day, so it's nice to be able to set up the iron, go into the kitchen and make my coffee, and hear a tone when it's time to go back and iron my clothes. My previous iron couldn't do this, so it left me holding my hand to the surface to feel if it was hot yet - I can't even say how many times I burned myself that way. This iron has a spray mist, which helps remove stubborn wrinkles. It's similar to the one found on almost every iron, however this mist nozzle doesn't clog as easily, which means you can spend more time ironing and less time trying to clear the nozzle or find a spray bottle to moisten garments. When combined with its wonderful soleplate, my Black & Decker can knock out even wrinkles I previously thought I would have to have professionally pressed out. Amenity-wise, this iron has a wonderful handle. Having previously had to grip an uncomfortable plastic dowel, the wonderful padded hand grip this iron provides is wonderful and makes ironing a, dare I say it, possibly even enjoyable task. In short, this iron is wonderful for the price and provides many different convenient features to try and make ironing as bearable as possible.